I had a desire for barbecue chicken. Do you ever get those gut desires? This time I had to follow my desire … and I wasn’t disappointed. This is taken from two recipes that I combined and frankly – it came out great! First I made the ingredients for the chicken coating (rub). My kind of recipe — not too many ingredients. The ingredients for the barbecue sauce were a few more but manageable. I thought the ingredients for the barbecue sauce would make too much but it evaporated just like the recipe said plus I halved the original recipe. So … let’s look at the recipes. Mix the spices in a bowl and dip the chicken pieces in it to coat the chicken. Put the chicken in an oven proof baking dish. Prepare the barbecue sauce while the chicken is baking. After 35 minutes (or so) take the chicken out of the oven and brush it on both sides generously with the barbecue sauce. Put the chicken back in the oven for 5 additional minutes. Put all the ingredients in a medium saucepan over medium high heat and stir to combine. Taste and adjust any seasonings to your liking then bring to a boil. 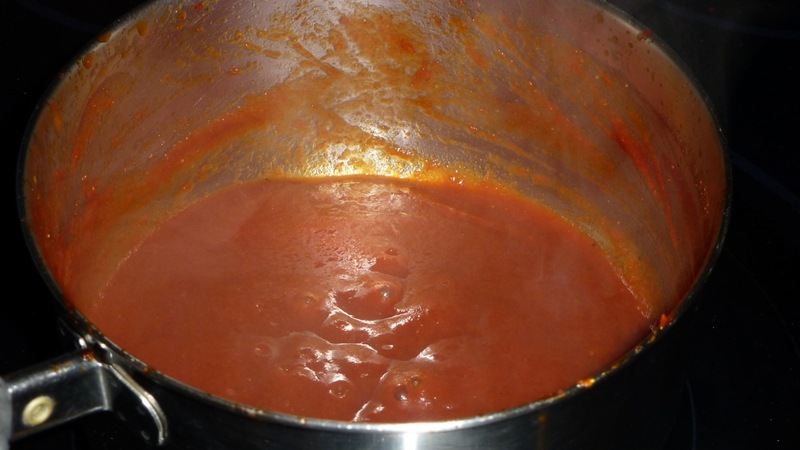 Reduce the heat to low and allow to simmer for approximately 1 hour. Brush the barbecue sauce on the chicken. And this is the beautiful final result. Ahhh .. I’d say heaven but I don’t believe we’ll be eating meat there as there will be no killing … so, I’ll say delicioso!